Copa America 2019 is all set to kick off from June 14 in Brazil. The mega event will be played in six stadiums of five different cities of Brazil. As usual, this time as well the competition will be among 12 nations. However, two nations from Asia are invited this time. The Asian Cup winner Qatar and Japan will be joining the South American giants in the 46th edition of Copa America. The 12 nations are divided in three different groups, Group A, Group B and Group C with each group comprising of 4 teams. Each team will play each other one time among the group members. That means, a team will play three matches during the group stages round. The top two finishers from the each group will qualify for the quarter-finals, making 6 out of 8 teams for the last eight lists. The remaining 2 void spaces in QF will be filled by the top two third finishers from the three groups. The knock-out round will start from quarter-finals with top eight teams from the group stage round making it to this round. In quarter-final, the winner of Group A will take on the third placed team of either Group B or C. Similarly, runner-up of Group A will take on the runner-up of Group B. The winner from Group B will take on the runner-up from Group C and the last quarterfinal will be among the winner of Group C and 3rd placed team of either Group A or B. The semi-final and final match will be played accordingly (as per the table below). Screen-shot captured from Wikipedia page. 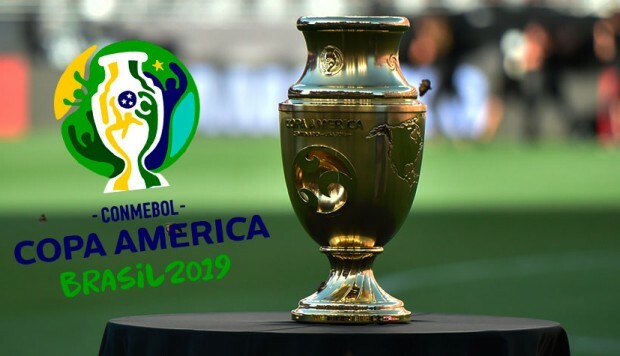 This entry was posted in General Details and tagged Copa America, Copa America 2019, Copa America 2019 details, Copa America team details. Bookmark the permalink.